Little late this morning! Well, I’m back from vacation and totally not rested at all, but very happy nonetheless! 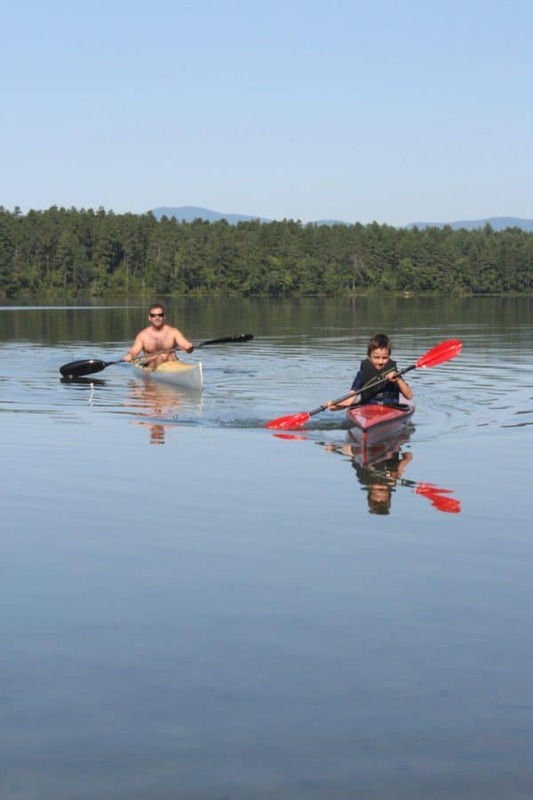 We made great memories and were in beautiful places with lots of family everywhere — York in Maine, Squam and White Lakes in New Hampshire. But we certainly weren’t in the lap of luxury. I will not be writing about our stay at a stunning, quaint little inn with beautiful woodwork and 5 star cuisine. Pic from last year’s annual trip to White Lake Sate Park in Tamworth. NH. My pics are from various camping trips. We were camping. Kids love camping. I love camping. 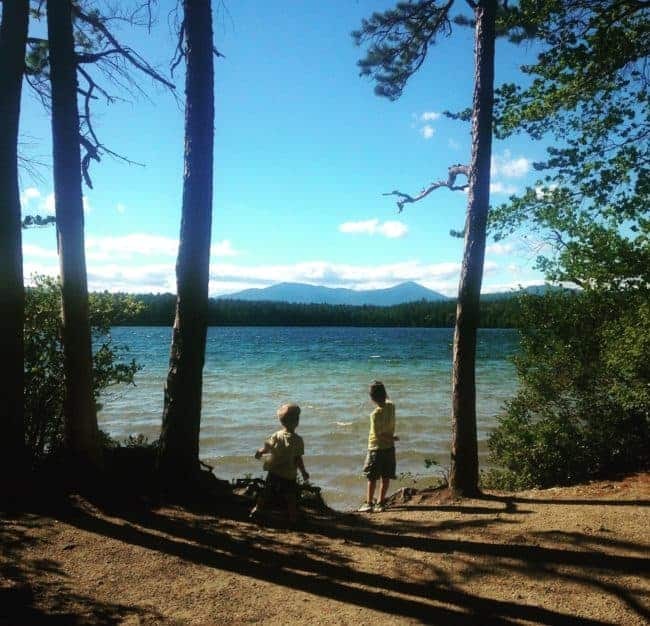 Pre-kids, I loved backpacking in the backcountry when I had the chance. When I was kid, myself, I never fully appreciated how much work camping as a family was on the grown-ups! Do you know how much food you have to think about and prepare?!?!?! Because everyone wants hot breakfast and hot dinner. Over a little camp stove. Or sometimes a charcoal fire (thank you, Handsome Husband.) No, Frosted Flakes will not do. (Just to clarify — I put pressure on myself for good food, no one else does. If I’m on vacation, then I’m darn well gonna eat like it!) And then you have to wash your dishes in a little tub, and trek back and forth for the water to wash and rinse, and get all the particulate matter out, and dispose of the gray water responsibly…. 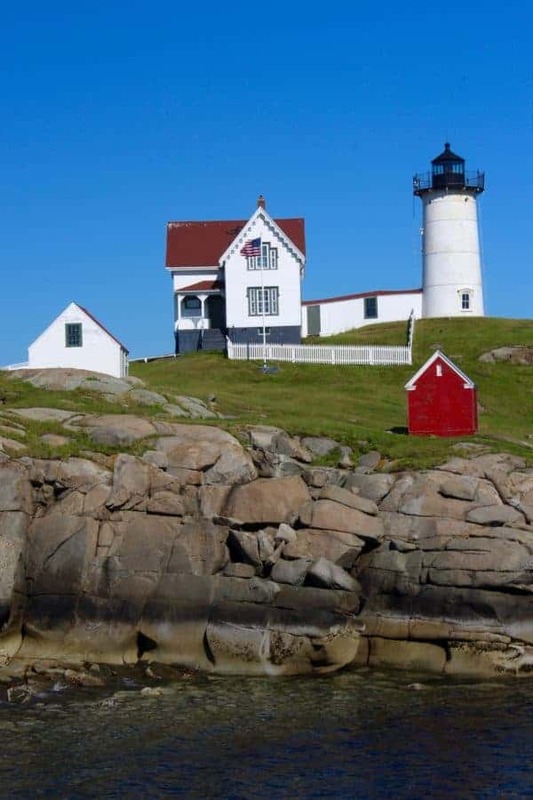 Nubble Light in York, ME. We’ve been going to York for 25 years. And forget about packing the camping equipment, let’s talk about the toys! Bikes, helmets, baseball gloves, soccer balls, swimming floats, beach toys, books, stuffed animals, etc. Big boys need toys, too. Thing 1 in Acadia National Park. Small boys love big tents. Thing 2’s first time in a tent two years ago. … and smiles from kids who think they’re real adventurers and rough ‘n tough rangers. So — a HUGE thank you to my Mom and Dad for taking us on all those camping trips through the years! If the Handsome Husband and I barely manage it twice a summer for a few days each, your grandchildren have your inspirational example to thank. And then there’s “glamping.” Super corny name aside (I think of “Brangelina” and “Bennifer.” Gag me, sorry. ), the idea always kinda made me scoff. The whole “get-out-into-the-woods-and-experience-the-smell-of-the-campfire-without-any-effort” — I compared it to losing weight solely through liposuction vs. working like hell to get it off. Where’s the sense of reward? I’m sorry, but my Girl Scout camp didn’t look anything like this. Longitude 131 in Australia, where Prince William and Duchess Kate glamped a few years ago. The idea of glamping made me scoff when I was pre-kids. Now, well … I’m just tired. I envy the girl who paid for liposuction while I struggle run uphill with my BOB stroller and 35 pound 4-year-old just a tad. Oh, how the mighty have fallen! I want comfort more than I’m willing to admit, sometimes. And pretty interiors as well as exteriors, too. Add insult to injury, I recently received pitches from the PR reps of two new glamping grounds practically in my backyard. But could I go see them myself and report? Nope. Because I was camping. Luckily (and when I mean luckily, I mean luckily for the glamping grounds, not me 😉 ) Boston Magazine and others with more reporters felt that they were good stories and paid to send someone up there take pics. So while I wasn’t available to be on the ground with the hot story, I knew to look it up and share it with you … and just as vicariously. Kennebunkport hoteliers Tim Harrington and Debra Lennon invested more than $5 million into creating Sandy Pines, a “high-end camping” experience, on a campground formerly known as Salty Acres that had seen better days. When I first heard about it, I couldn’t help but think they were geniuses. 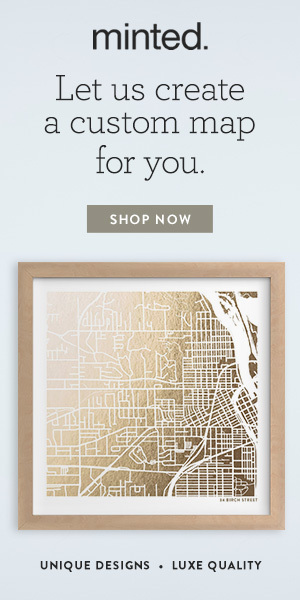 This is what everyone (everyone with the capital, anyway) should do with all those run-down tiny little one-room cottage vacation rentals from the ’50s that spot the state routes throughout New Hampshire and Maine, IMO! But campgrounds are not money-makers, so I knew that this was going to be something very well executed or they’d go bankrupt in the first season. Having been in the marketing/PR world for a number of years, myself, I really admire Sandy Pines’ whole “package” — and the PR “hook” Harrington and Lennon devised to get drum up public fascination and press coverage. The branding has a beautiful 1950s vibe. I only just learned about Huttopia and the press coverage has been more limited so my info is spottier. So much so that I don’t know if it’s pronounced “huh-toh-pee-ah” as it looks phonetically or “hyoo-toh-pee-ah” like the Thomas More book. Located near North Conway, NH’s Huttopia was originally founded in Lyon, France in 1999. A network of outdoor getaways designed for reluctant campers, it offers a range of comfortables cabins and tents without the bother of setting them up. The company operates more than 30 locations in France and Canada. This is the first U.S. location. I wouldn’t call it glamping per se — more like heading to a rustic cabin. Nothing shameful in that! How do you feel? I’d love some thoughts here!